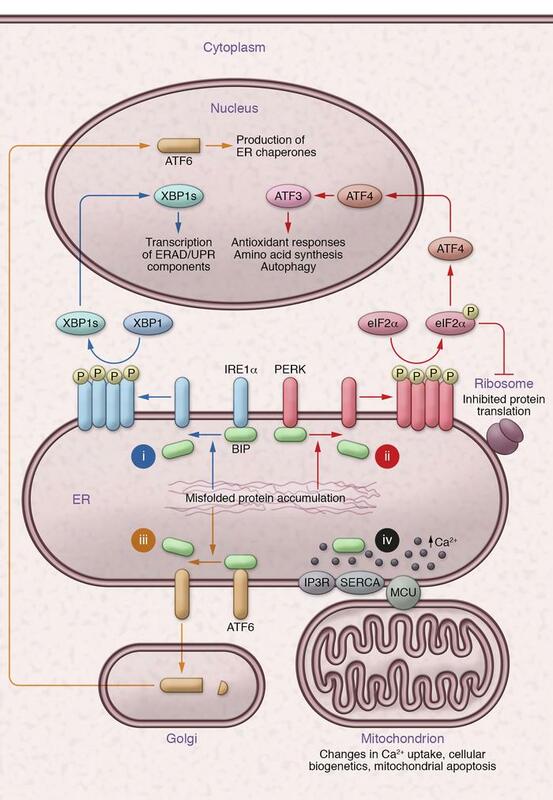 Overview of ER stress–related signaling. Bip binds to accumulating misfolded proteins in the ER, leading to its dissociation from the three ER stress sensors, IRE1α, PERK, and ATF6. (i) Dissociation from Bip allows IRE1α to multimerize and autophosphorylate, activating endoribonuclease activity that leads to alternative splicing of the transcription factor XBP1. Spliced XBP1 (XBP1s) then translocates to the nucleus and promotes transcription of components of the ERAD system. Oligomerized IRE1α loses stringency of endoribonuclease activity and activates regulated IRE1-dependent decay (RIDD), thereby degrading mRNA and miRNAs. (ii) Bip dissociation leads to dimerization and autophosphorylation of PERK, which phosphorylates eIF2α to inhibit protein translation and signals for ATF4 nuclear translocation. Once in the nucleus, ATF4 activates ATF3, which induces adaptive antioxidant responses, promotes amino acid synthesis, and promotes autophagy. (iii) Bip dissociation from ATF6 permits its transit from the ER to the Golgi, where further processing allows trafficking to the nucleus and subsequent increases in production of ER chaperones. (iv) Bip and other ER chaperones serve as calcium-binding proteins. The ER tightly controls the cytosolic calcium pool available for mitochondrial uptake through the mitochondrial calcium uniporter (MCU) via sarcoendoplasmic reticulum Ca2+ ATPase (SERCA) and the inositol triphosphate receptor (IP3R). Through its regulation of calcium flux, the ER plays a central role in the regulation of cellular bioenergetics and mitochondrial mechanisms of apoptosis.